Immediately I was like — this looks awesome! But it only runs from April through September, from 5-9pm on Thursday nights. So for a while I couldn’t go because it wasn’t happening. And then I couldn’t go because of work. And then it was closed again. And now I work really close, but I just kept forgetting about it. Long story short: it took a while to make it over there. There was a puppy in the shuttle with us, and later we saw the puppy-owner playing with the puppy in a big circle of kids on some Astroturf. So I think it was a… professional puppy? Because allegedly no pets are allowed? (If you can read the sign in the photo above.) Just so you know… that might be a job that your puppy can apply for. In case your puppy isn’t pulling its weight just by being CUTE. Eventually we ate dinner in this lovely Pagoda (with an excellent view), because all the little farmers’-market tables were filled with people. So… we win, table-sitters! HA. Here’s another view of it, with Downtown LA in the distance. Not a bad place to perch for a bit. 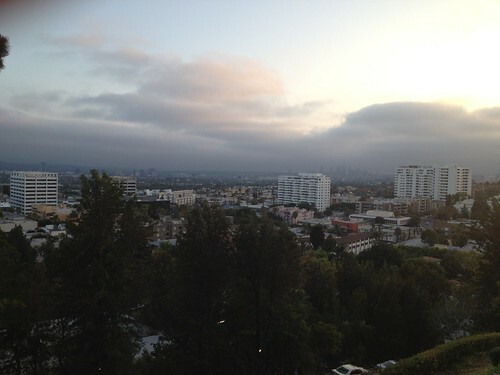 The view out toward Dana’s side of town (the Westside). Stormy-ish. After dark the view was all glowing and glittering, but that’s not a great time for non-professional cameras. So… I don’t have pictures of that. I’m sure you can find them somewhere. 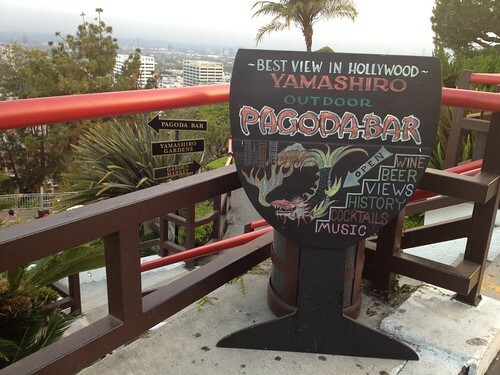 We walked to the top of the stairs and found the real Yamashiro restaurant (and many valets), but for some reason I didn’t take a picture of it. It was a very cool building, keeping with the Japanese-style architecture. 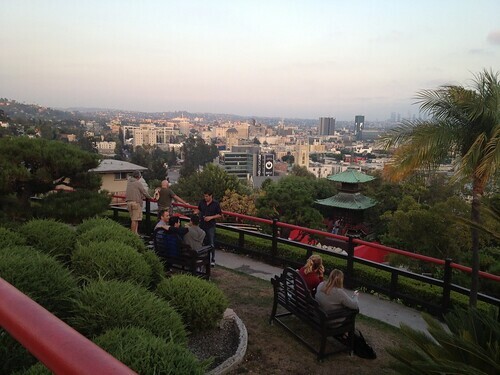 But I did get a picture of the “Best View in Hollywood” sign. 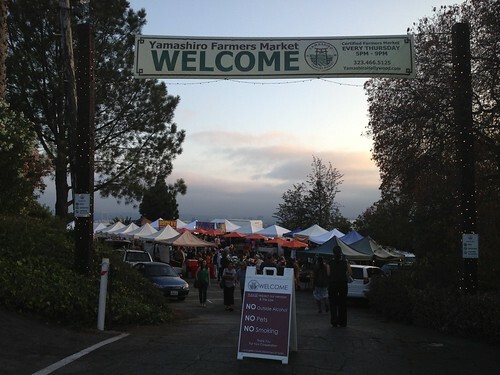 As for the food… I kept hearing about these legendary tacos at the market. 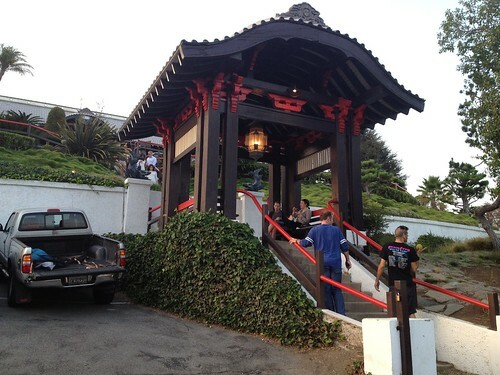 But the Yamashiro booth was selling… sliders. The Heirloom LA truck was there (I had their lasagna cupcakes at a catered party recently-ish), and the Border Grill truck was there (selling tacos… but I’ve been to the Border Grill, and I was pretty convinced that the famed tacos were Yamashiro’s own). 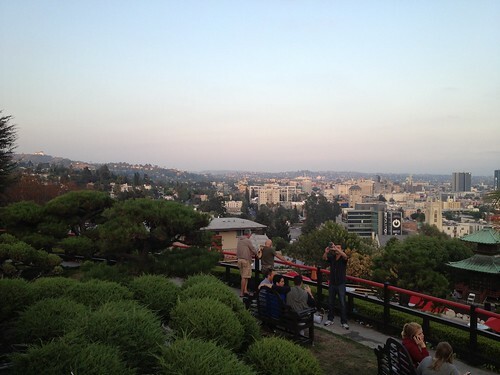 But when at Yamashiro… I ordered the sliders, hoping they’d maybe end up being tacos. (I got the chicken one lettuce-wrapped, just because.) I also wanted access to the crazy pickles. 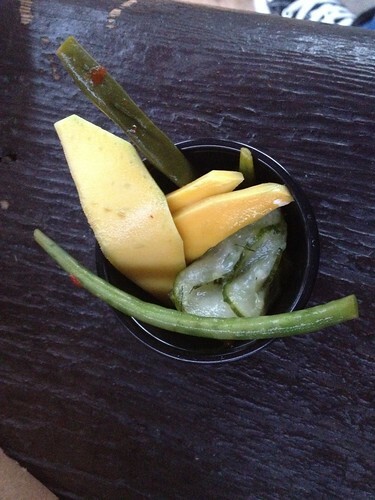 Dinner a la pagoda bench. 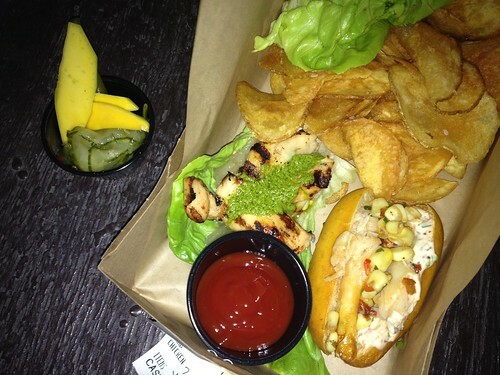 What you’re seeing: pickles (we’ll zoom in next), a crab slider (sort of a small crab version of a lobster roll), and a jidori chicken lettuce wrap. And chips… which I think were homemade. One of mine was soft in the middle, which made me VERY happy. It reminded me of a county fair. And the ketchup had something added to it. Shibuyo? Shibuso? But it still tasted sufficiently Heinz-y. Pickles all sorts of ways. The pickles were, off the top of my head/memory, mango pickled with ginger/wasabi, haricots verts in something sweet/spicy, and garlic dill? I enjoyed them, in small doses. If they weren’t too spicy for me, they’re probably okay for anybody. And then Sam got his first Coolhaus (not pictured) — mint chocolate chip and chocolate chip cookies. The mint was a little too garden-y for me, but I got used to it. (I grew up on the Baskin Robbins version of mint.) At some point I’ll trek to their store so I can try whatever I please. 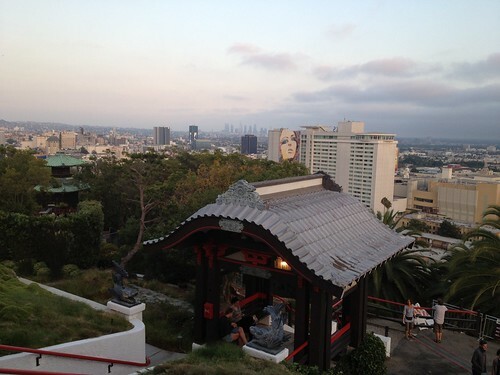 So that was Yamashiro! Finally — dreams do come true. You should go, too! It’s a not-so-secret awesome thing to do in LA. And I have to go back, if only to finally try these evasive tacos. Previous Previous post: DO IT YOURSELF: (Baked) Eggs — The OTHER Other White Meat?